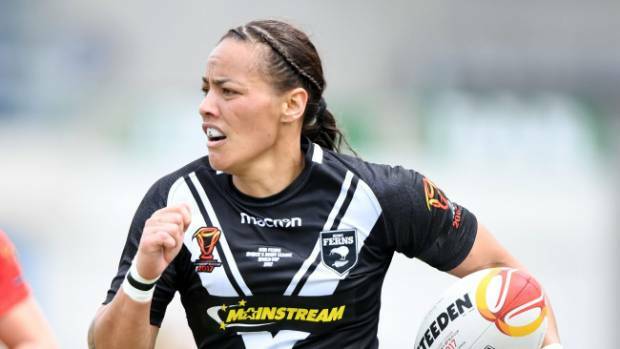 As she has been all tournament, the Kiwi Ferns outside back was the chief destroyer in their 52-4 romp over England in Sydney on Sunday, crossing for three tries as they booked a decider against Australia. However, she earned the ire of her coach after twice handing the ball off to a team-mate while having the try line open and begging. After bagging six tries against the Cook Islands, dual international Hireme took her tournament tally to 11 at Southern Cross Group Stadium in Sydney. But she should have had more. In an unselfish and obvious attempt to deflect attention off herself, she allowed a team-mate to score when all she needed to was plant the ball over the line. First, in the 67th, the Kiwi Ferns created space on the left edge and Hireme looked certain to score however she passed it to Hilda Peters, despite having the line wide open in front of her. Then with the final play of the game she busted through five tackles and was in the in-goal however handed it off to skipper Laura Mariu. The England team were still in the hunt down 14-4 at the halftime break thanks to a Tara-Jane Stanley four-pointer in the 22nd minute. Hireme had a mixed first-half but put her stamp on the match after the break, strolling over in the left-hand corner six minutes after the resumption. The Kiwi Ferns will face Australia in Saturday’s final after the reigning champions thrashed Canada 58-6 in the other semi.